Join the discussion on our forums! 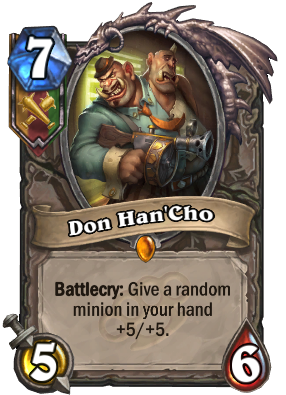 Come discuss Don Han'Cho over in our dedicated Don Han'Cho discussion topic. Battlecry: Give a random minion in your hand +5/+5. The brilliant mastermind of the Grimy Goons, Han sometimes thinks about ditching the idiot Cho, but that would just tear him apart. Value control card, will only see play in some niche situations for paladin and warrior. It's playable, but not broken like some doctor I used to know. so boring, like the rest of the expansion. We've barely seen a third of this expansion but Blizzard is doing nothing to hype the players. In one and half week we ONLY saw the +x/+x mechanic on the hand, it's extremely boring to see identical cards for 1 week. Very good but kinda lame. I wish it had a more interesting affect, especially if it triggered off like Reno and Kazakus. Right now, if you want a Super-Reno deck you need to play Kabal. The whole Grimestreet buff in hand theme is meant to be seen as a viable way to build Mid-Rangey decks. A plan and play on curve deck like that could use a bomb to finish up the game, a card likeC'Thun . Don Han'Cho is not that bomb, but it can help you create one while giving you a body that is good at trading down (at least 5/6). It has the same problems of Grimestreet Cards of being bad on a topdeck situation, but at least it can work w 2 cards in hand to make back to back strong plays on a game of attrition ( Dopplegangster ). I don't see him being played on control as it is a win more card in those decks, Control is more about stabilization. Now as for combo, I could only see it in Warrior, as the other 2 classes don't have enough card draw to make it work. This also a good card on curve! C'Thun, Grommash Hellscream, Tirion Fordring, Ragnaros, Lightlord, Varian Wrynn, King Krush, and more will all enjoy a healthy buff from him every now and then, I think. Not to mention the Brann synergy. So sad I turned him to dust. And this is why Hearthstone is taken like a joke and poker game. Lazy design, strong card, just like most competitive cards nowadays. Boring design, would be cool if the text was: Create a custom weapon. It's good (also slow) but really boring. Hopefully we'll see some more exciting stuff. 15/13 Grommash Hellscream? (When activated) Sign me up! 7 mana, so it works with Brann, +10/+10 wow!!! Your C'thun is now 16/16 with just two cards.